How to Image Windows 8/8.1 to a New Hard Drive? How to image Windows 8 or Windows 8.1 to a new hard drive? AOMEI Backupper could make the job simple and easy. Imaging Windows 8/8.1 to a new hard drive brings a lot of convenient. Window 8/8.1 operating system is acclaimed among Windows users, no matter home users or small business users. Windows 8/8.1 acts as an important role. However, it still faces a serious problem that the hard drive disk may break because of series reasons, such as virus, human wrong operation, a great heavy shock, or some other unexpected situations. Once those happened, the data loss will make users suffer a big damage. In case of those errors, image Windows 8/8.1 to new hard drive is necessary. Actually, backup Windows 8 disk to new hard drive can not only protect the data, but also can apply to install the same system to another PC. If you want to upgrade the system or change a new hard drive for your PC, imaging Windows 8 can provide a simple way that you can restore the image of Windows 8 backup. It could save a lot of time. Imaging Windows 8/8.1 to a new hard drive is a good way to prevent the hard disk broken. But how to do it? With the help of Windows 8 snap-in tool, you may create a system backup image easily. However, the disk image is different with system image. There isn’t a tool that you can backup disk directly in Windows 8/8.1. You’d better use a third party backup software to help you. Considering the security and convenient, here we recommend you AOMEI Backupper Standard. Before you do, please prepare a new hard drive which had enough space to store the Windows 8/8.1 backup image and plug it in the computer. First, download AOMEI Backupper Standard, install and launch it. You will see the main interface of this software. 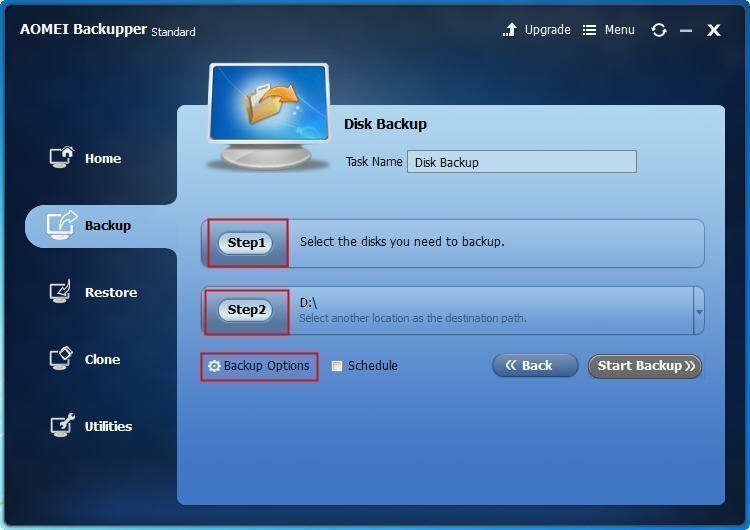 Click Backup and there are many backup types - System Backup, Disk Backup, Partition Backup, File Backup, and File Sync. Select the Disk Backup. Second, after opening the interface of disk backup, you can choose the disk to backup at the step1, and select the destination (the new hard drive you prepared before) at the step2. You can click Start Backup to start the proceed. 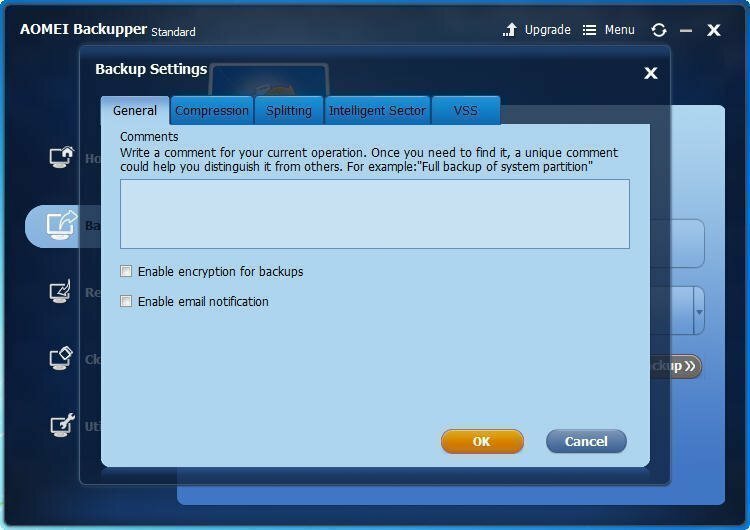 If you want to setup more for the disk backup, for example, add a comment, you can click Backup Options, and set it under the General label. After all the settings, click OK and click Start Backup. When the proceed reached 100%, click Finish to end up the task. You can use AOMEI Backupper to make the disk backup image of Windows8/8.1 to a new hard drive, and you can also use AOMEI Backupper to restore the image files when the disk broken or the data loss. 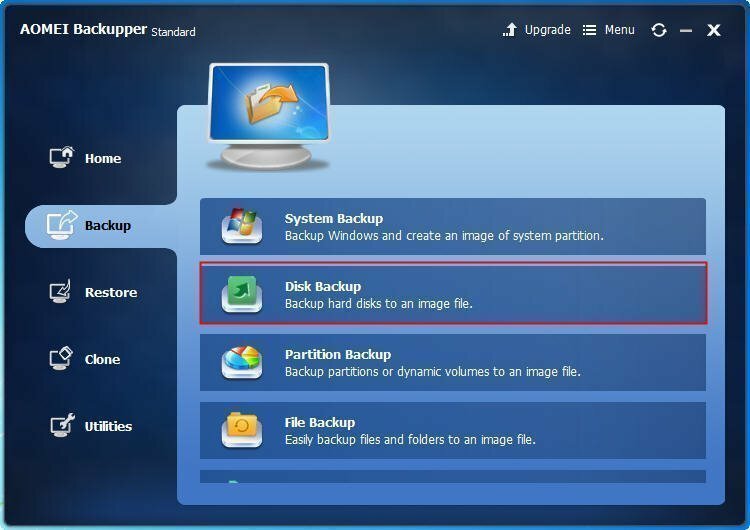 You can restore the disk backup image to dissimilar hardware, and you can use it to upgrade the hard drive. If you try to restore the backup image to a new computer, you must use a bootable media or the PXE Boot Tool to boot the computer. AOMEI Backupper Standard is a free software and it supports Windows 10/8.1/8/7/Vista/XP.